Disney World has been struck by Cupid's Arrow and love is in the air at the Magic Kingdom. From Feb. 1 through February 15th, a new segment has been added to "The Magic, The Memories, and You!" show that is projected onto Cinderella Castle each evening. Special scenes from the most romantic moments in Disney Animation have been added to this special limited time show. 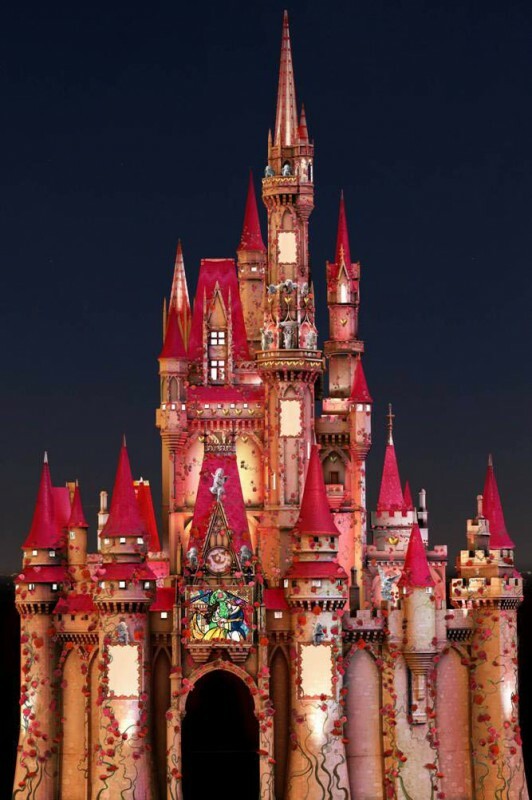 Picture Cinderella Castle covered in red roses one moment and later transformed into a star-filled sky. From depictions of beautiful stained glass windows to the stories of your favorite Disney Princesses: Cinderella, Snow White, and Belle, the romantic in each of us will be brought out while viewing this moving show. Don't miss the opportunity to catch this show with your someone special before it is gone! It is another example of Disney Magic at its best. 0 comments to "Magic Kingdom Celebrates Valentine's Day During February With Special "The Magic, The Memories, and You!" Show"